Well, I think they look like cells. A new print run for the swap. Hand printed with a potato stamp onto unbleached calico. Today I hosted the Little Gem Session in the newly cleaned up shed. 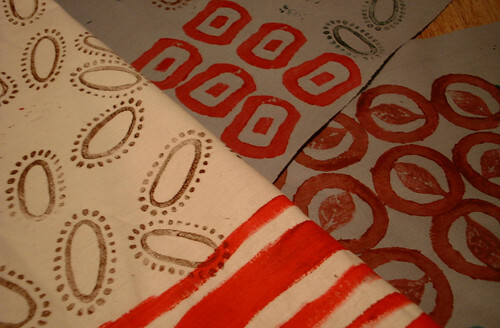 I was experimenting with lino prints, hand painting and potato prints on calico and cotton drill. 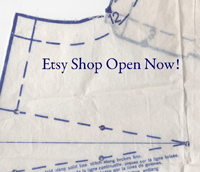 I’m getting ready to do a fabric swap with Jezze in South Africa. 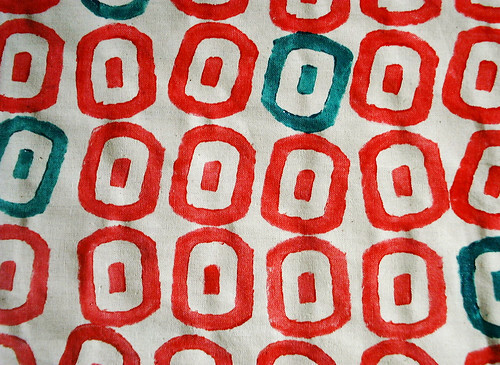 The potato prints seemed to work best with the thinner fabric paint. The lino prints really needed the tacky block print ink to get good coverage but I’m not sure how well they will wash. The leaf inside the circle is an eraser stamp I carved a while back. This article I started writing a wee while ago was intended for World Sweet World but due to a miscommunication it seems I missed the deadline so you lucky readers get to read it first and free! 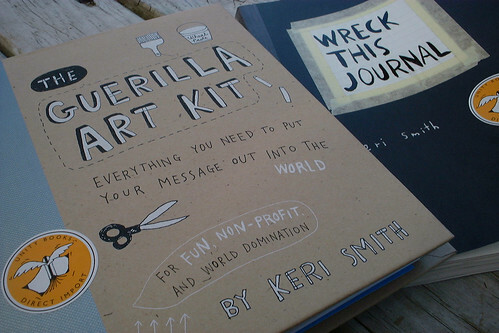 Speaking about Craftivism / Guerilla Art, I picked up a couple of book orders yesterday – oh Joy! Keri Smith rocks!! 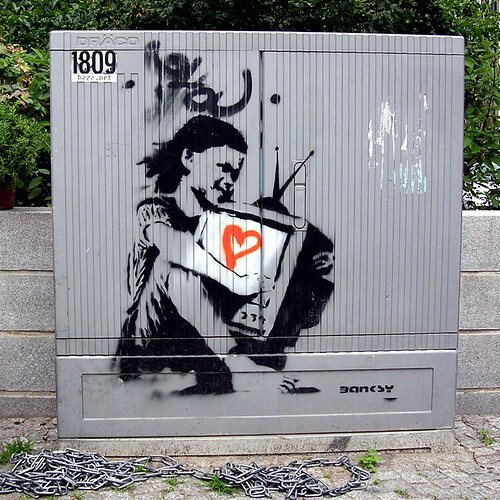 banksy TV stencil, originally uploaded by Loso. Two old work mates are launching two new projects in one week. They are both very clever and talented in their field so I’m shamelessly promoting them. The connection is Unity Books, where we all worked in the 90s. I could write a post just about all the amazing people who have worked there but today I’ll just focus on two. 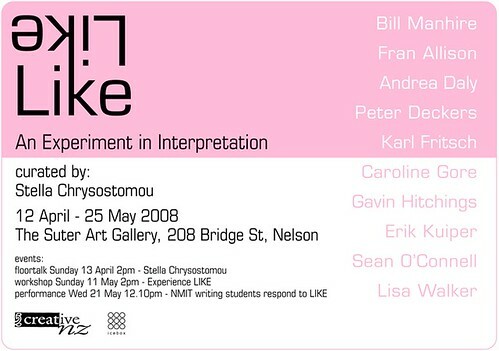 Adventurous, playful and provocative, LIKE: An Experiment in Interpretation explores the ‘translation’ of an object between media: from the physical to the written, and then back to the physical. LIKE takes an object, a writer and a group of jewellers on a rigorous expedition of exploration and interpretation. One object given to Bill Manhire to interpret in verse results in an array of objects in translation. The jewellers have deciphered the text and through their individual interpretation made the resultant objects. The objects are both similar and wildly different raising questions in regard to perception, interpretation and the process of making. Damien Skinner was just a young fella when I first met him (we all were! ), when I guess he was writing his masters thesis. This book is a version of his doctoral thesis. In The Herald Damien says the thesis is “the larger story, asking what is the carver, what is the artist and what might be the relationship between the two”. It is a journey likely to continue for a long time yet. You can read a review on Beattie’s Book Blog. You can get a copy of his book at Unity Books in NZ or Amazon if you’re abroad.